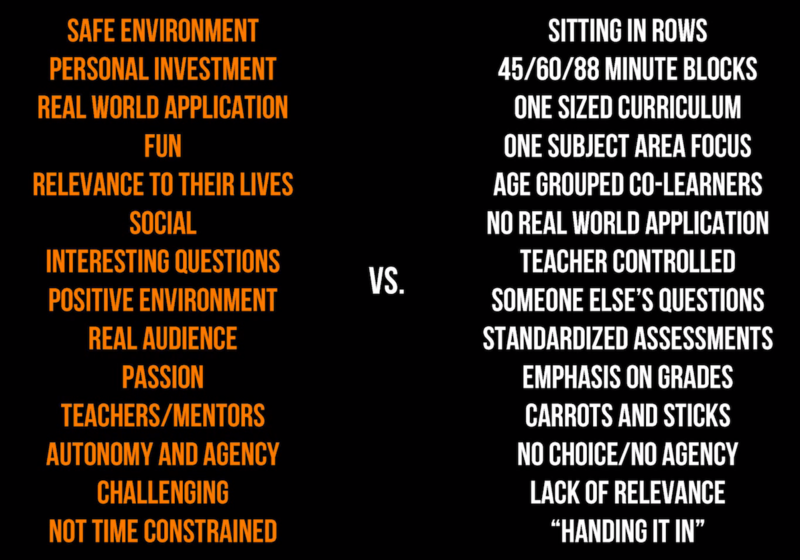 In a great TEDx talk, Will Richardson gets at the heart of what school is and what it should be. Take 16 minutes to watch the whole thing1I would have embed the video in this post but the folks at TEDx WestVancouverED disabled that feature., but if you don’t have time (or YouTube is blocked in your school), this slide is a pretty good summary of the differences. Those terms on the left side, or variations on those themes, have been included in speeches, reports and white papers from any number of education “reformers” since at least the turn of the century. For the most part the list on the right side represents classrooms from the turn of the previous century. And is still what you’ll observe in almost every American school – public, private, charter – here in the 21st century.